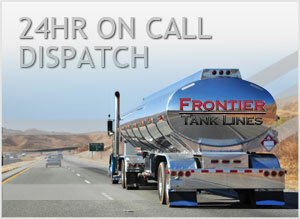 Frontier Tank Lines provides a dependable 24 Hour On Call Dispatch Team to assist with your fuel transportation needs across Texas, Oklahoma, and New Mexico. Regardless of the circumstance, if you need help our 24 Hour On Call Fuel Assistance Team is standing by and ready to help. 24 hours a day, 7 days a week, 365 days a year, we’re committed to keeping your business fueled and fully operational. Whether your have a short or long term emergency, you can’t count on Frontier Tank Lines to keep you flowing with a steady supply of Biodiesel, Crude Oil, Diesel, Diesel Exhaust Fluid, Ethanol, Gasoline, or Jet Fuel. We provide emergency fuel service for all of Texas, New Mexico, or Oklahoma. Let us assist you, when you need it the most. call us at (800) 291-7876.